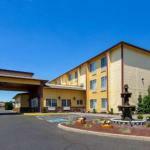 Our guests get a free hot breakfast an indoor pool and a non-smoking atmosphere at the Best Western Plus Walla Walla Suites Inn close to downtown attractions. The Best Western Plus has three floors and 77 rooms equipped with microwaves refrigerators and coffeemakers. Clock radios and cable TV with HBO are included. The hotel starts your day with a free buffet breakfast while you catch up on events with a free newspaper or the Wi-Fi connection. You can enjoy the fitness room heated indoor pool and hot tub anytime and the outdoor patio when weather permits. Conveniences include a 24-hour business center guest laundromat 24-hour front desk and free parking. Dogs are welcome for an additional fee. Three blocks from Highway 12 the hotel is a 10-minute walk from downtown Walla Walla and its historic architecture galleries and shops. Whitman College is less than a mile from the hotel and Walla Walla University is three miles. Fort Walla Walla Park and Museum and the Whitman Mission National Historic Site are within four miles. Check out some of the region's 90 wineries many of which are downtown or within walking distance. Tri-Cities Airport is a 49-mile drive.